Because of moisture and the possibility of a flood, leak or water accident, the materials used to finish the walls, floor and ceiling in your basement should be able to stand up to water and moisture. In the video below, Larry Janesky, owner and president of Total Basement Finishing, will show you how different basement finishing materials react when exposed to water and typical basement humidity. For the experiment featured in the video, an environment was created to simulate a basement plumbing leak, and tested four flooring and four wall materials. A basement subfloor product sold in hardware stores consisting of a chip-board with a dimpled plastic mat on the bottom. ThermalDry Insulated Floor Decking, which is an inorganic magnesium oxide board insulated with rigid foam insulation, developed and sold exclusively by Total Basement Finishing. Total Basement Finishing's MillCreek Flooring, which is a 100% waterproof, inorganic flooring option that mimics hardwood floors and can be installed straight against the slab without a subfloor. Wood studs, fiberglass insulation and drywall, with a wood baseboard (the most common wall assembly in the U.S.). Total Basement Finishing's EverLast Basement Wall Panels, which is vinyl-finished cement board insulated with rigid foam, and a PVC baseboard. Total Basement Finishing's Smart Wall System, which is a variation of the EverLast system, consisting of continuous rigid foam board insulation installed against the wall, with attached metal studs over the foam board, to hang a vinyl-finished cement board, and a PVC baseboard. 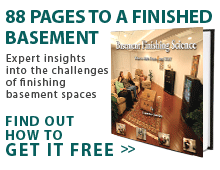 Based on the results of the experiment, Total Basement Finishing products clearly outperform traditional basement finishing materials. All Total Basement Finishing products are specifically designed for basement conditions; they are resistant to moisture damage, mold and mildew. If you're interested in finishing or remodeling your basement with Total Basement Finishing, schedule a design consultation with your local dealer today!